This is a gatefold wrap card I made from one of my doilies. I just quickly decorated it using some very old peel offs that I found while clearing out my stash. Hope you you like it. A dull day so the photo isn't very good. Would appreciate a comment if you do download the file. Thank you so much Shirley for sharing. If I ever get my cutter back in action I will be back for this gorgeous file. Love your other creations too. Thanks for the fun free file- great card! Lovely file and thank you so much. Great file thanks Shirley so pretty. Love your other new files too, definitely the mojo is grafting! or crafting LOL. Great idea to use foiled like that Shirley makes a lovely card.Love the box don't think I'm brave enough to make one love them though.the bee card is cute too. 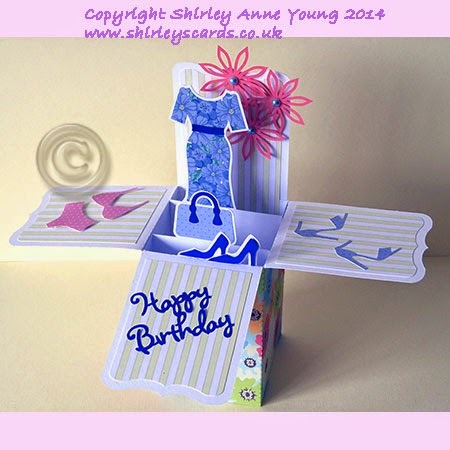 Just found your blog, lovely work, so enjoyed looking through, become a follower and looking forward to popping in to see all your new creations. Hope you'll come and visit me too. What a lovely gate fold design! Thanks so much for sharing. Beautiful cut file Shirley, lots of detail there. Thank you so much as ever.